Grease guns are essentials implements if not a must-have in any maintenance job site such as a garage. They are specially designed to dispense lubricants (in this case grease) that keep fittings, joints, bolts, spindles, and suspension links among other parts or components of machinery and automobiles in the ideal working order. Although the primary function of these very useful tools is the same thing, not all models available for purchase are identical. To be precise, there are five different types at present all designed with distinct traits and equipped to suit various purposes. While some may be comparable, it is never in the best interest of any user to assume, every type they can lay their hands on can solve every lubrication concerns. The more reason you should always strive to identify what comes close to matching your needs for this apparent reason. Finding the perfect fit is no walk in the park given flooded pool consumers have to pick from. The confusion and difficulty that come with the process is understandable especially for those lacking the slightest idea of where to begin or what features to consider. In the text below we cover the factors worth having in mind while shopping for the most appropriate grease guns and also suggest some top recommendations to make your work a little easier. When your desire is all about a performance-oriented grease gun that delivers definite and consistent quantities of a lubricant, a top-range grease gun should be your trusted partner whether you're working at your home garage or at a professional job site. To this end, the all-rounded DEWALT DCGG571 is here to fulfill all your lubrication needs now that it is crafted to be on top of every situation that needs its utilization. With this tool, you can forget about the hassles synonymous with ordinary models that are known to offer below average performance. It ranks high in our list based on the simple yet weighty reason that everything about it points to one conclusion which is quality performance. 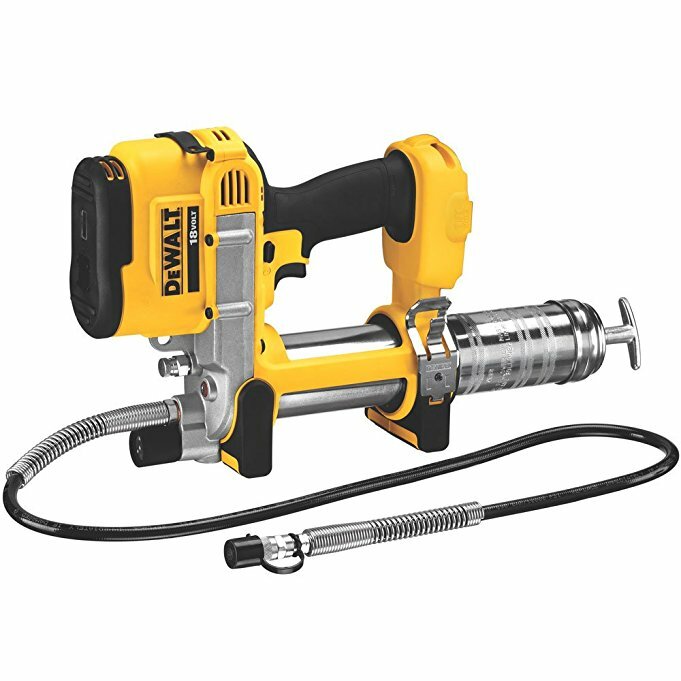 True to every reality and given the blend of features it is equipped with, any user of this grease gun would no doubt pick it again and again over others the intensity of application notwithstanding. That said, we guess you are now wondering what makes this model from the great Dewalt brand special. To start with, the DCGG571M1 boasts of an exceptional design that is indeed hard to come by. Its adaptability to a wide range of projects will ensure you will get precise pushes. 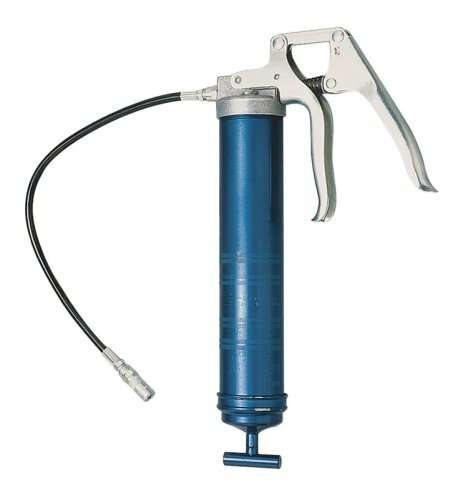 From every end, this grease gun was manufactured to provide nothing short of quality results. Considering that it comes with a reliably robust motor, it can deliver up to 10000 psi ratio at optimal operation. And you know what? It gets juicy, the gun’s pumping volume is quite reasonable. It provides 5.0 oz. each minute showing precisely how much you can achieve with it. The lubricating process is made so enjoyable taking into account that this grease has a variable speed dial that primarily allows you play around with the intensity of delivery in line with your needs. Talking of power supply, it features a 20V MAX XR Premium Li-Ion Battery (4.0 Ah) that is dependable enough to allow it run up to 16 canisters on a single charge. By all means, this is sufficient for any greasing projects you may throw its way. To ensure the tool is at all times on top of the game, the manufacturer includes a pump filter screen that efficiently grants you the power to keep tabs on performance. Similarly, this model comes with innovative filters designed to shield the unit from intrusion and contamination by filth. You will be thrilled by the valve and anti-dust sieves ability deter blockages on the tool. Apart from the fact that this grease gun is portable, you still have additional leeway when movement becomes an issue. Thanks to the DCGG571M1's 42-inch flexible hose, you can go about greasing even the hard to reach corners and the farthest parts you are working on. At no point will you have your access limited because with such an extendable hose no spot is too tight to conquer. And when you are working in dark places, the inbuilt radiant LED light comes in handy to help you navigate your way through the parts so easily. 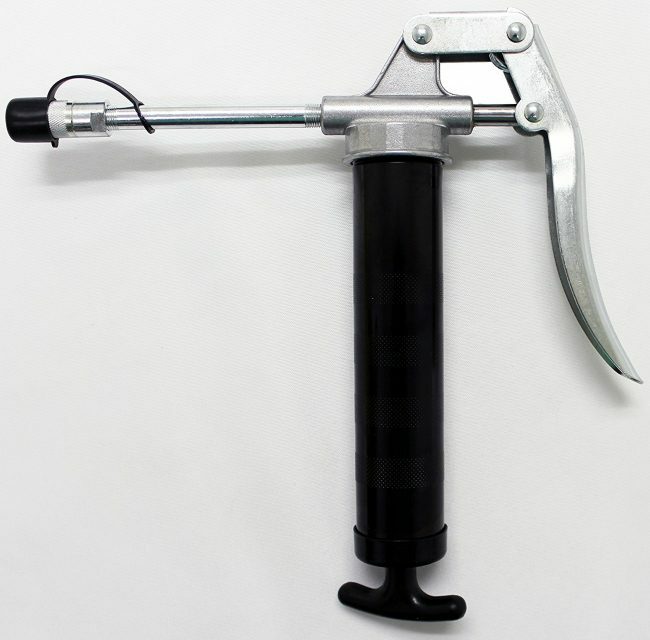 Another positive feature you will love about this grease gun is its utility no-mar foot design which essentially saves the user from any hassles when resting the device. It will not scratch any delicate surfaces if you have to place it there. The DeWalt DCGG571M1 is one of the best-equipped models in the market today. Although it is not as pocket-friendly as many users would like, it is also the most suitable for various greasing activities. It is quite useful if you want to accomplish massive and simple lubrication tasks alike. 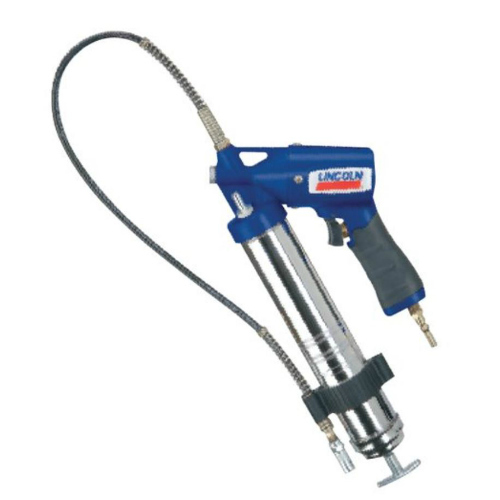 If you are no stranger to grease guns, the name Lincoln needs no introduction. A favorite for many DIYers and professional handymen alike, the brand is known for exceptional quality models that cannot fail to grab your attention when you are out shopping, and this 1162 Air Operated model is no different to the widely held assertion. As far as control over the device is concerned, the manufacturer does not disappoint by including a variable speed trigger which allows you to explore multiple rapidity levels even as you exercise firm regulation. With the trigger, you can achieve a high level of fine detail when it comes to realizing continuous and consistent performance. The ability to vary the speed according to needs is a significant scoring point for this model over its competing alternatives. You will enjoy the automatic and customizable flow of grease from this device without facing common jamming concerns. The Lincoln 1162 has a ratio of 150 pounds psi on the lower side all the way to 6000 pounds of pressure per square inch which is quite impressive and ideal for a wide array of greasing requirements. Any passionate maintenance guy will appreciate a pneumatic grease gun that allows them to dictate the exact amount of a lubricant that lands on the specific part of the machinery under service without any undue delays. Again, in sharp contrast to most air operated grease guns bedeviled by pockets of air inside the barrel, the design of the Lincoln 1162 proves worthy enough. The innovative make ensures limited chances of air bleeding. The large pump design coupled with a reliable motor facilitates high-speed pumping thereby getting rid of air pockets so efficiently. Even though air bleeding may not appear as a real threat at the mention of it, but looking carefully it can be so problematic to the extent of stalling grease discharge when it gets to extreme levels. Therefore, the design is no doubt a plus to getting the work done. This grease gun is also highly rated for its 30 feet flex hose extension that gives the user an additional edge when it gets to maneuvering tricky regions or when movement is no longer possible. In this case, it will literally turn your spacious working space to a convenient playground where nothing is too difficult to overcome. 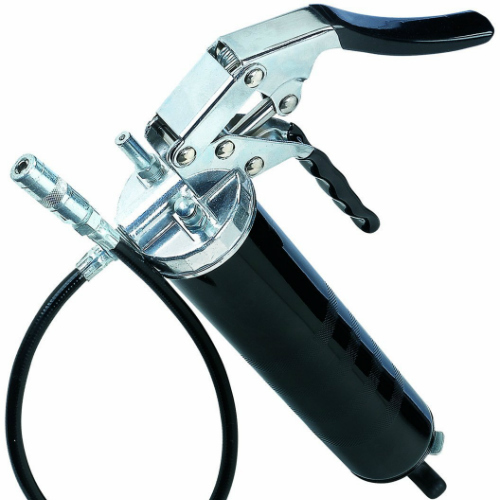 If you have money to spend on a grease gun then this is by every right an exceptional choice. It will not only offer you accurate delivery of grease, but it will also serve you for years to come going by its solid built. You can save a lot of time on various tasks because the performance will remain satisfactory no matter what gets on its way. At its price, this model is worth checking out. The Lumax LX-1152 is a good pick for all the hobbyists and professionals who have been craving to upgrade to new grease gun without having to spend a fortune by all standards. As a dependable quality device, this model features a resilient construction of 18-gauge stainless steel that is solid enough to survive very many years of use without bowing to the pressures of wear and tear. You can expect maximum endurance in the face of accidental drops because the build can withstand it all without cracking or deforming. If that happens, you just have to pick the unit, dust it up and keep going from where you left because no matter how severe the impact may be its never yielding to the slightest bit. You will also love the chrome plated finish on the handle that prevents waning over time even under sustained use. The Lumax LX-1152 comes with a lightweight and portable design to afford the user added convenience. Specifically, it is manufactured for one hand use. Its sleek and flawless profile makes it so easy to use this in that it is less taxing on the hands. You will be surprised how smooth it is to lift this grease at various positions and angles because the experience is nothing but incredible, to say the least. In a way the traits above make this model unique considering the weight you may have endured or are likely to experience by going for other rival options. What's more? This tool boasts of an 18 inch pliant hose extension ideal for accessing all hard-to-reach engine parts or hidden bolts. Moreover, this model comes with a robust cast iron head which by all due considerations is a humongous selling point. Not only because it can produce up to 7000 psi ratio (it's small size not limiting) but also as a result of the high degree of consistency it can offer under unpleasantly rough circumstances. 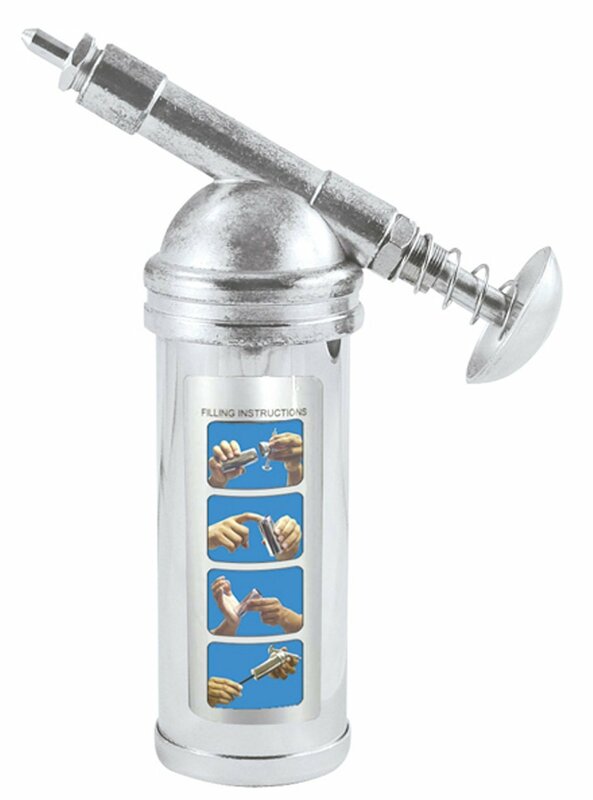 You will be proud to own such an efficient device because with its ability to dispense 4 oz. of lubricant in every one hundred strokes you are well set to grease whatever parts, joints or bolts and much more. To save you from the bothers of irregular grease flow, the Lumax LX-1152 features air bleeder valves that serve to do away with air pockets that are known to cause inconsistencies or even stop the application. The valves vent air from within the pump thus maintaining a uniform flow of grease at every point of lubrication. Besides that, they also facilitate fast cartridge change. If up to this point all the traits do not make the cut for you yet, we bet the level of comfort granted by Lumax will tick all your boxes. For instance, when it comes to loading you have three options to choose from. You can use the cartridge, suction or utilize the grease pump. Regardless of your choice, the process is quick and easy, not to mention how effortless it appears. Coupled with the fact that the grease gun weighs a mere 2.9 pounds you will enjoy working with it considering the grip is also smoothly shape to allow firm and comfortable holding. Another positive trait of this gun is the incredible follower rod lock that deters any unintended grease discharge. However, you always need to release the rod lock whenever you want to get to work. Otherwise, it may result in disruptions which you definitely don't want to happen. The Lumax LX-1152 is a real bargain if you are looking for pistol grip grease gun packed with performance oriented features. With it, you will be in a position to accomplish all the lubrication jobs with precision because it is impressively versatile. Above all, it is affordable and is worth every penny. Are looking for a heavy duty grease gun that can allow you to lubricate freely as much as you want? Do you want a device that will grant your wish for precise grease flow for a long time to come? If your answer is yes, the Lincoln Lubrication 1134 is what you may have been looking for all this time. Coming with an exhaustive list of appealing features, this model from Lincoln stands out from all ends. To begin with, it features an advanced pump design with a motor that can generate up to 7500 psi at full potential. And to put the much-needed controllability over the process into your hands, the manufacturer includes a variable speed trigger. Consequently, you can alter the speed depending on the job requirements from time to time. Similarly, the Lincoln Lubrication 1134 has a toggle working mechanism making is it a top contender in many ways. By preventing incidences of jamming, the system will ensure this grease gun remains so efficient beyond your comprehension. You will be happy to experience its solid follower spring that functions to guarantee no interruption in the flow of grease immediately you begin pumping. Ideally, when you pull the trigger, the follower spring will move back and forth from the position as a result getting rid of any air pocket that may have formed within. Again because the toggle mechanism also prevents the plunger from bending, it will help prevent the pipe from getting clogged with grease. Of course, if the lubricant gets stuck inside the hose it will obstruct fluidity which is a real problem. To the contrary, with this grease gun, you have continuous and accurate delivery of the lubricant during the entire operation. The Lincoln Lubrication 1134 further comes with a check valve meant to allow the user clean and refill the gun without necessarily putting every component apart. So whenever you want to do some routine cleaning, you don't have to scratch your head because with the valve everything is so easy. It goes without saying that this grease gun is a reliable grease gun. Thanks to heavy-duty construction, you will be able to enjoy excellent services from a strong, powerful and equally cost-friendly tool that performs to expectation. Another fantastic model that meets our criteria for top-rated grease guns and is worth getting your attention is the Grease Tech Premium. Very few lubricating guns come close to the elegance and functionality afforded by this tool. Whether you have more than overwhelming lubrication workload at your garage, workshop, service station or you just want to roll over some hobbyist's stuff this may be the charm to help go on the offensive. At only 2.6 pounds, this grease gun features many lovable traits that make it best-suited for all manner of lubricating projects. In the first place, it comes with an appealing barrel construction measuring 2 inches in diameter, 9 inches long and has a capacity of 400 c.c. of grease. 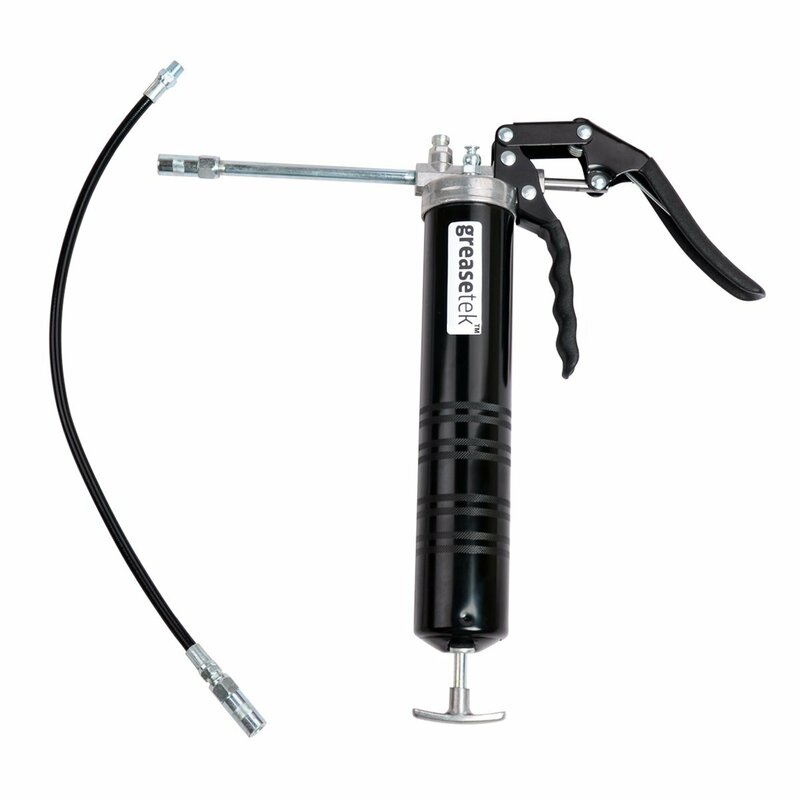 Like most high-end pieces, the GreaseTek Premium grease gun comes with a flexible hose. The 18 inches long tubing accompanies the coupler making the model perfect for use on tight areas. As such, nearly no restriction will stand on your way to achieving top-notch results because you already have sufficient reach with the extension hose. Also worth highlighting is the ergonomic pistol grip handle that allows users to take full charge while working with this model. The advanced nature of the grip guarantees maximum control without slightest hesitation because it's very comfortable. Similarly, this grease gun features ridges and indentations to facilitate secure clasping in the hands for smooth execution. At no point will find the tool slipping off your hand because the knurled body will always save the day. And when you are about to look another away because of air bleeding, the manufacturer includes an appreciable Anti-Bleeder Valve to save you from all the priming troubles. As if that is not good enough, the gun also boasts of an intuitive filter valve to help keep dust and dirt at bay. As a consequence, you will not only have to worry about air bubbles limiting the grease flow, but you will also maintain a clean tool in good working shape. This option takes flexibility a notch higher by featuring the double-positioning grease loader which is quite attractive if you need to work from different angles. You can enjoy the freedom of loading the lubricant from either of the two distinct positions. The GreaseTek Premium Grease Gun may not be the number one model on our list but, it has a lot to offer if you are in search a user-friendly model at a reasonable price. If you have used some devices before, you will realize that you are much better off with this model that some old school version that has various cons. If there is one thing that underscores the DCGG5170B 18V cordless grease gun, then it would be how beautifully its features blend to get the job done. This medium weight model from the DeWalt brand is a sure hit if you are looking for a versatile and high performing lubricating tool. The first thing that will attract you to this model is the robust motor created to produce and supply to the extremes of 9000 psi ratio. The pumping mechanism is so impressive given its emission speed of 5 oz. per minute which by all standards really swift than most devices of comparable standing. When you find that too much, you will be happy that the unit is equipped with a speed trigger to help you regulate the process accordingly. That way you can get enough flow to complete tasks at hand without much ado. At the same time, you have a 14.5-ounce cartridge to operate on which is reasonable enough. To ensure all the engine parts, gears, wheels, and bolts are never out of reach, it comes with a 42 inches hose to facilitate effortless access and application of grease on cramped or hidden segments you may have to work on occasionally. The ultra-long hose is flexible hence can adapt the needs of any sophisticated sections of most machines and automobiles. In reality, when it comes to coverage, this grease gun knows no boundaries because the unit is considerably lightweight. 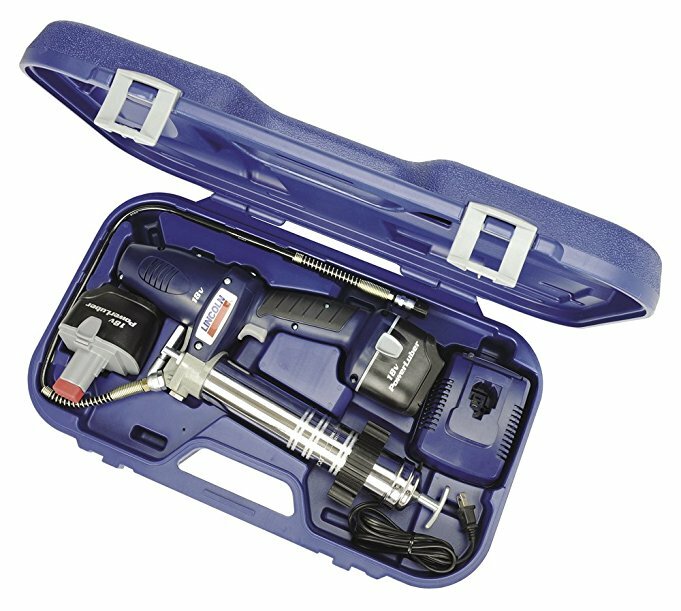 Coupled with the fact that it is a cordless tool, you can utilize it at all corners of the workstation as the project demands. And what is more? DeWalt takes every second of greasing seriously. Thus, this gun comes equipped with anti-filth filter to keep the internal engineering from any exposure to harmful particles that may bring operations to an abrupt halt by interfering with grease flow. Likewise, you will find air-bleeder valve that eliminates air bubbles that may accumulate in the system for excellent results at all times. Even after changing a canister, you will not suffer from the inconveniences of air bleeding. Another feature that cannot be overlooked apart from how it is defensive it in the face of filth and dust is the ability of the DeWalt DCGG570B to work in dull areas. Featuring a shiny LED light, this grease gun is designed to operate effectively in dark areas without fumbling in the process. The lighting will illuminate every spot aiding vision even as your maneuver through the parts. And when you want to put the grease gun down for a rest, the no-mar foot design will be more than handy to see you through any doubts if you are concerned about damages. 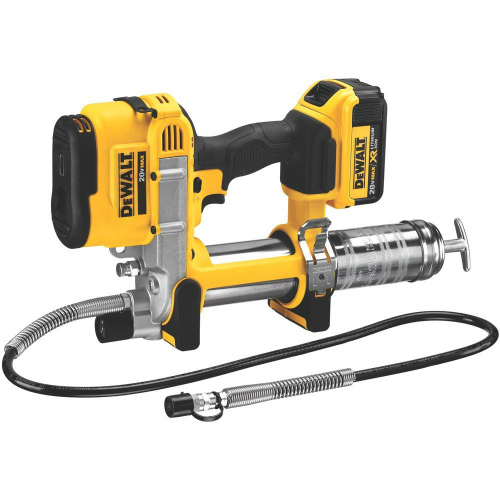 If you have a reasonable budget for a grease gun whether you are lifetime maintenance professional or just a typical handyman who believes s/he can do it all, the DeWalt DCGG570B is one lifesaver you can buy. If you have a particular interest in lever action grease guns, the Lincoln Lubrication 1133 Two-Way can be an excellent addition to your workshop or garage. As expected of this type of lubricating device, it will demand a little physical effort to keep it running. But the good news is that the results of the process merit your energy in every way. First, thanks to its hardy construction, the Lincoln 1133 has a high-level stability which tells of its ability to withstand the test of time under various conditions of use. 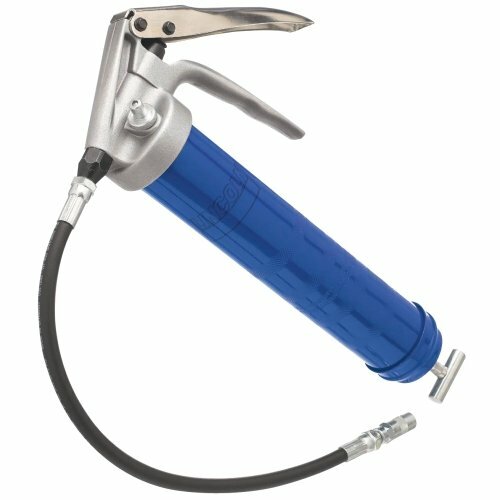 The heavy-duty nature of this grease gun ensures components both within and outside the tool remains solid under impact or in case of normal wear and tear pressure. Weighing a mere 3.4 pounds, you will be startled by the simple but equally purposeful design. The overall composition of the device points to efficient delivery of grease flow as the job necessitates. In fact, it comes with an 18 inches long whip hose and coupler that helps in the precise conveyance of grease. It can create up to 7500 psi ratio now that its motor is a real powerhouse. It will win over every lubrication job you may throw its direction given the commendable pumping volume. Using a standard cartridge of 14.5 oz., this model is capable of producing 1 oz. in every 33 strokes. You can never assume this level of output any day. And talking about eliminating the nuisance of blockages, the manufacturer includes an inbuilt spring that has the backing of a follower for optimal priming. As a result, you can forget about inconsistent grease flows because the traits mentioned above serve to rid the gun from blockage. The jam-free working mechanism guarantees certainty by allowing the efficient release of lubricant on necessity basis. As far as cleaning goes, that aspect is taken care of as well. Needless to say, you will love the guns vent that can be adjusted (fastened or loosened) accordingly to release any impediments that may have settled on the interior of the device. In this case, therefore, you can have the tool in good working order without dismantling everything to clean up. The Lincoln Lubrication 1133 is manufactured to offer years of greasing service. By acquiring this model, you get a working companion that is durable, versatile and is bound to deliver results. Above all, the pricing will not break your budget so can give it a shot for new experience altogether. If you have been looking for a hand held lubricating tool that is simple yet incorporates all the attractive features you can ordinarily get in a grease gun, then you better off try the Lumax LX-1172 Black Mini-Pistol Grip model. This device is as versatile as it is powerful and the more reason it fits a wide array of projects. It is good enough for professional workers, the same way it worthy for occasional DIY undertakings. By all means, it proves to be a valuable pick in case you decide to buy it help you through any relevant jobs whether at the garage, farm, contractual applications and more. Just at face value this grease gun will invite your interest for a whole lot of reasons. Although it may not be as decorated as other models you may have come across, in our view, it cannot miss the discussion whenever the topic is all about mini grease guns available in the market. Talking about the one thing that is attention-grabbing, then the convenience afforded by this tool comes on top. The small size is quite fascinating because it gives you the freedom to carry the device around. As a result, you can always roll on job anywhere without limitation. For example, when it gets to the sophisticated maneuvers in the hard-to-access parts, you will be thankful for owning a tool of considerably diminutive size. Besides the gun features an appreciable pistol-style grip that grants optimal hold without the slightest chance of slipping during the entire lubrication process. You will be able to dispense grease evenly single-handedly worry-free. If you are in doubt regarding how long this tool will last under sustained and intense use, you will be impressed to realize that it boasts of cast alloy construction that makes it resilient enough to both internal and external pressures. That way you have the guarantee of extended periods of use. Although the Lumax LX-1172 does not work on conventional cartridges, it comes with 3.2-ounce mini-cartridge that so useful. Moreover, the model supports two-way loading which is pretty straightforward for new users to grasp. You can benefit from the possibility of quick operation because everything is at your disposal. The Lumax LX-1172 is, by all means, a decent model that will be of great help if you need to accomplish all your important jobs within the shortest time possible. With its realistic features, you can achieve excellent delivery of grease beyond every expectation. At its price, you got to thank the manufacturer for such a quality product. Go for it. The Lincoln Lubrication 1844 works the magic if you are looking for a standard kit that comes with all the mid-range features at a reasonable price. Manufactured to run with an 18 volt high capacity battery, this gun promises of up to 30 percent more power than what you would ordinarily expect. Its motor will win you over with its ability to generate an incredible amount of pressure that can work for either light or heavy-duty projects. Unlike other devices of similar status which tend to wane as the working conditions get tough, this will remain steady at every point of need. The Lincoln Lubricating 1844 cordless also features 120-volt PowerLubers which also affords more power thereby facilitating better performance for whatever lubing job. It operates on an efficient toggle mechanism that delivers nothing but quality output. It can run up to 10 grease cartridges on one charge telling of the smooth operation you are bound to enjoy in case you buy this device. And since the battery is included in the package at the time of purchase, you will not be compelled to spend any extra cash to have this grease gun ready for the job. You will be interested to know that this device is equipped with a dual overload protection feature that makes sure grease dispensation process is always consistent and up to speed with the needs of the project at hand. Just like it is with any other power tool, the balancing of speed is so critical to all the efforts directed towards achieving impressive results. The manufacturer takes this seriously no wonder you the freedom of working on two distinct speed variations. It means you will not have to tolerate any hassles when it comes to regulating the tool to give the appropriate rate for the job. Ideally, of the two-speed variation options, one is suitable for high pressure lubing where you can get to the maximum of 7500 psi ratio at full power. On the other hand, the second option works best for those better off working with high volume grease flow. At that point, the machine can supply at the rate of 10 oz. per minute. The dual function system enhances the ability of the user to keep touch with varying lubrication requirements of various machinery or their components. The Lincoln Lubricating 1844 comes with a host of traits to ensure longevity. First, the pump head is ruggedly constructed guaranteeing more resilience in the face of extreme encounters. Similarly, it the overall build tells of a robust product that does not disappoint when it comes to sturdiness and durability in good working order. 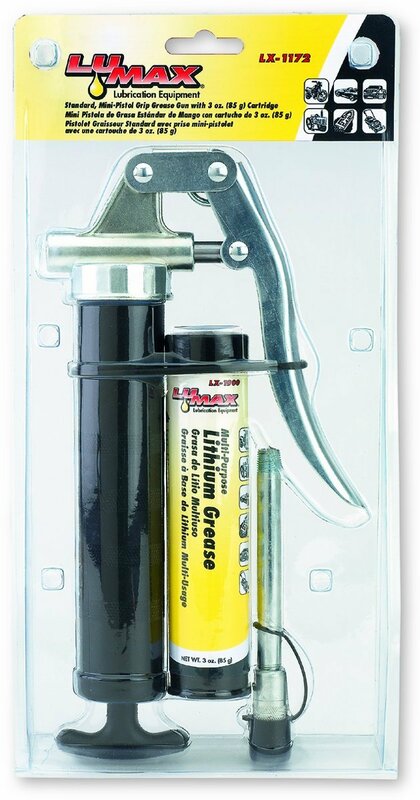 If you are that handyman looking for a high-quality grease gun that offers satisfactory performance, the Lincoln Lubricating 1844 grease gun is worth your money. It blends all the features that will leave you top-notch results for long time to come. Just because the Astro 100 Mini Grease gun comes as the last option on our list shouldn’t give you any reason to doubt its potential. The first thing to remember about this grease gun, unlike other alternatives of equal level designed to deliver massive amounts of the lubricant, the Astro 101 Mini is a little-sized working partner is ideal for those slight jobs that can do with comparatively less volume of grease. The size notwithstanding, it can still offer intense lubing power. It is designed to hold 3 oz. of light and mid-range lubricant which is in the real sense perfect for small tools and fittings. Away from the size, which we like to emphasize is not telling of its ability to perform, it is also lightweight. Working with larger tools has its shortcomings. Among them, you will not be in a position to execute every move with the much-needed comfort. To that end, utilizing such a mini grease gun goes down well with the comfy needs of many professionals and hobbyists alike. Certainly, if you find this model perfect for the job, it will be rewarding because it is set for one-handed use considering it weighs only 1 pound. The weight is no burden at all in your hand even if you have so many tasks at hand that would take hours to finish. Talking of the guns outlet and its ability to dispense the lubricant, this tool maybe by chance the best the market has to offer when it comes to models with needle-style nozzle. One thing you will find charming is how perfect it is for various air tools characterized by smaller parts or fittings. With the needle nozzle, finding your way around the (whether complex or basic) components is a piece of cake because by the end of it all the exact amount of grease would be dropped on the correct spot. It goes to show how worthy it is to have this in your collection of power implements because you never know when you may be conditioned to call it into action. On a negative note, the Aluminium body of the Astro 101 can easily get compromised in case of impact. However, we hope that won't be a big problem considering the gun is of small size and is equally lightweight hence may not absorb the impact as much if it drops or gets stuck by some object. Not every day will you require a powerful tool that serves all manner of projects? So when you need that little genius what else is there to go for other than the Astro 101 Mini grease gun? You have to try this to feel it. The first thing that should ring your bells is that there are five categories of grease guns namely Air Operated, Pump, Lever, Cordless and Pistol Grip. Each has its own vantage points and weaknesses over the others though not in equal measure. For instance, while one type can produce more pressure than the rest, another can derive its edge in terms of versatility and power. But the main reason for buying any of these is lubrication. So, the more a grease gun is created to perform the more justification you have to go for it. The ease of operation, the intensity of the greasing you may need from time to time, and how dependable the tool is powered will among other handy features can help you settle for the best. An efficient device is that which has total control over the quantity of grease emitted after the trigger is released. Any models that will allow you to spray the lubricant at the desired spot and help you achieve optimal results with higher accuracy and speed is worth owning any day. The best way to point out such guns will be look and pumping capacity, pressure per square inch (psi) or the output per stroke of a gun. The less a device demands to give satisfactory results the better for you. Although performance should be a priority when making your decision, how equipped a particular gadget is with regard to ensuring longevity is equally valuable. A durable piece goes a long way in saving you time, effort and money. As such you should look out for a tool thriving in a heavy-duty build that can endure knocks here and there, withstand impacts from falling, and that which remains steadfast over wear and tear pressure of abusive environments. Also, by checking how a model is resistant to filth or dust and the sturdiness of the components you are more likely to get a better deal. Another vital parameter to consider when you are about to buy the best grease gun should be how comfortable you will be while using the device. The ability to use the tool in awkward conditions and tight angles is a huge plus. The same way working with a model with simple to grasp operating mechanism will save you from any stress. Before spending your hard-earned cash remember to focus on simplicity of loading the cartridge, ease of cleaning, inbuilt accessories such as a LED light for use in dark areas, adaptive hose and nozzle, and variable speed trigger just to mention. Overall the unit should blend features that make greasing super easy. Because we all operate on a budget, it is crucial to have in mind your limits when it comes to the price range. Usually, the cost of most models pretty much reflects the value you get but never assume that the more you pay, the better quality you get or the vice versa. Indeed, this is a common perception; however, you need to get around its inadequacies by cross-checking other traits such as durability and quality of results. What you are willing to spend also dictate your choice, but never comprise on performance just because your budget is too tight. Q: How do I know my grease gun’s output? A: First, a guns output relies on numerous factors key among them being the motor power. Typically, manufacturers will indicate the pumping capacity of their models per a given number of strokes. At the same time if you already own a device you can do a simple measurement by pulling the said strokes consistently over an electronic scale to clear any doubts. Q: What grease gun is best grease gun to buy? A: It is hard to pinpoint the best model from the countless options that have flooded the market. However, it is fair to say it takes more than a simple filter search to get a model worth placing your money on. The best way to know what is perfect is by double-checking your needs and what your options are on offer. The performance of a grease gun should always come first when choosing the best grease gun whether you are that serious professional or the passionate DIY warrior. Narrowing down to that lone ideal version for your job may require intensive research, but you will be glad deciding with adequate hints. Our recommendations above offer the perfect mix of efficiency, convenience, value and durability. Probably our guide will give you enough insight for informed decision making. Either way, if you mind the trouble, picking from any of the models in our list is just good enough.